To what extent is the mechanicals' performance of Pyramus&amp;#146;s and Thisby a success? 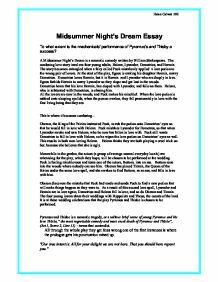 Midsummer Night's Dream Essay To what extent is the mechanicals' performance of Pyramus's and Thisby a success? A Midsummer Night's Dream is a romantic comedy written by William Shakespeare. The confusing love story involves four young adults, Helena, Lysander, Demetrius, and Hermia. The story becomes entangled when a fairy called Puck mistakenly applied a love potion to the wrong pair of lovers. At the start of the play, Egeus is making his daughter Hermia, marry Demetrius. Demetrius loves Hermia, but it is Hermia and Lysander who are deeply in love. Egeus forbids Hermia to marry Lysander so they elope and get lost in the woods. Demetrius hears that his love Hermia, has eloped with Lysander, and follows them. Helena, who is infatuated with Demetrius, is chasing him. All the lovers are now in the woods, and Puck makes his mischief. When the love potion is rubbed onto sleeping eyelids, when the person awakes, they fall passionately in love with the first living being that they see. This is where it becomes confusing... Oberon, the King of the Fairies instructed Puck, to rub the potion onto Demetrius' eyes so that he would fall in love with Helena. Puck mistakes Lysander for Demetrus, so that when Lysander awoke and saw Helena, who he now has fallen in love with. ...read more. Lion makes his excuses for his appearance in front of the ladies as he thought he would be so scary earlier on in the play. The women in the audience were touched by Lions speech and they found him very sweet and not scary at all. This is funny because lions are supposed to be scary and not sweet, I found it funny when Lion stood up and showed his face to make the speech because the whole point of wearing a costume is to pretend your not a human. Once more we have humour and alliteration but this time from the audience "monstrous mouse". This then gives Theseus a chance to make a sarcastic remark after Demetrius says, "Well roared Lion." Theseus says, "Well moused, Lion." Which people laugh at, making it even more ridiculous and losing the plays tragic plot even more. The script also is also written in nonsense and with puns such as when Pyramus says "I see a voice now will I to the chink to spy and I can hear my Thisbe's face" (Act V Scene I Line 195) This is a funny line because it doesn't make sense because Pyramus has got his words mixed up; His line doesn't make sense because one can't hear a face or see a voice. ...read more. The actor used his own voice and took off his wig because the audience were all giggly and he wanted to show that this was a serious and sad part of the play that shouldn't be laughed at. The BBC version did not show this same impact. It was the death scene that made the Hoffman version better because it was more interesting and a moving tragedy. Pyramus and Thisbe succeeded as a moving tragedy because of the following reasons. Their love is denied because they cannot meet but can only talk through a chink in a wall, therefore they can not marry. Pyramus believes that Thisbe is dead, because he discovers her shawl stained with blood, but is unaware that the blood is the lion's blood. He then kills himself to be with his love for eternity. Thisbe then discovers Pyramus dead, and kills herself out of her love for him; the tragedy being that they both died out of love for each other, and through misunderstanding. In conclusion, the story line of the play of Pyramus and Thisbe is a tragedy; however, the way that the play was performed allowed it to have comedy, through the script and the 'amateur' acting style. I feel that a tragedy was not a suitable entertainment for a wedding, however, the comedy made it more appropriate. Helen Calvert 10K ...read more. the world; if their order were unbalanced then nature would also be unbalanced. Without order in the land chaos would reign. The main characters within the fairy world are Oberon, the king of the fairies, Titania Oberon's queen and Puck Oberon's mischievous servant. She sighs and follows Hermia around, trying to imitate her, as she is so desperate to become her, she takes large heavy steps instead of taking little elegant ones like Hermia. Hermia tells Helena of the plan to marry outside of Athens, this shows their long intimate friendship and how Hermia trusts Helena. you not tell me I should know the man / By the Athenian garments he had on?' Although Puck is a very mischievous character and Oberon thinks he is up to his old tricks, he genuinely didn't realise his error; the two men, Lysander and Demetrius, were both wearing similar clothes. The solution, given by Bottom, is to write prologues explaining the situation. This theatrical convention, is made fun of through the mechanicals, who feel the need to explain everything through prologues instead of trusting to the intelligence of their audience. He makes some remarks in the play that sound funny because he mixed up his words when he was leaving the stage. Starveling was a tailor by trade and he got his name from the belief that all tailors were thin. 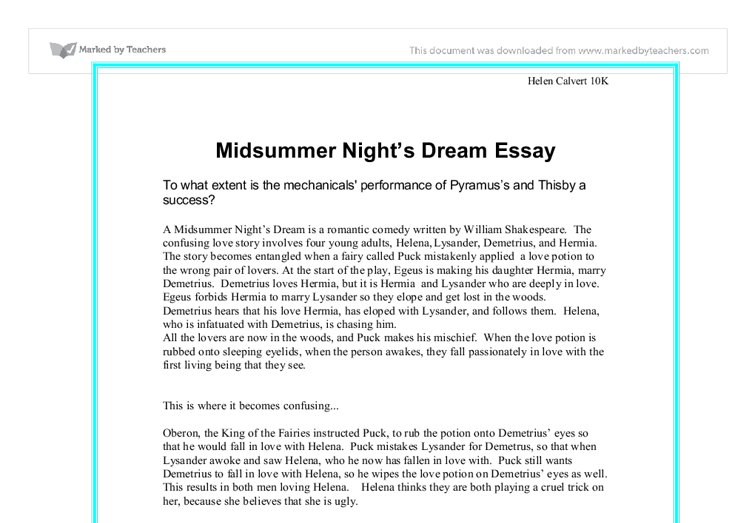 How does Act V make a good ending to A Midsummer Night's Dream? He believes that all three, moreover, do nothing but invent miracles and describe impossibilities - the poet in particular giving "to airy nothing / A local habitation and a name." This serves to challenge the audience's notions about reality and imagination. Explore the Ways In Which Shakespeare Presents the Rude Mechanicals. In addition this is also another to point to show Bottom's stupidity, you can see this in the contradiction, "monstrous little..." Bottom tends to come across as the bossy one who would really like to be in control: he struggles throughout the play to make himself appear more intelligent than he is in reality. Together they are parents to an Indian child servant. However, the two argue about whom the child is to stay with. We gain knowledge of who loves whom in the real world. Titania blames Oberon for the natural disasters in the real world. Titania suggests that the result of the quarrel causes strong gusts of wind, stormy sea, fog, loss of crop, floods, frosts etc.